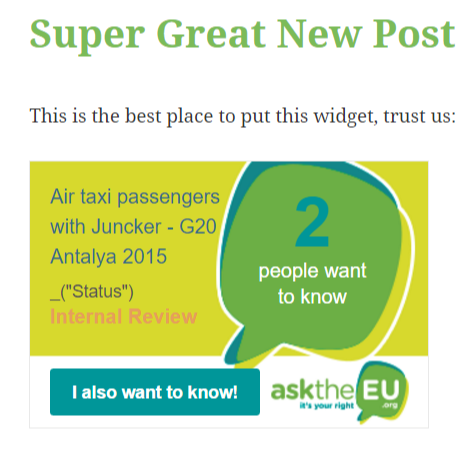 Now you can create widgets for your AsktheEU.org requests! This is a piece of code you can put in your blog or website, and it shows in a box the current status of your specific request. It also allows other people to support your request by clicking in the “I also want to know” button, so it can gain public backing from the visitors of the webpage where the widget is on. 2. 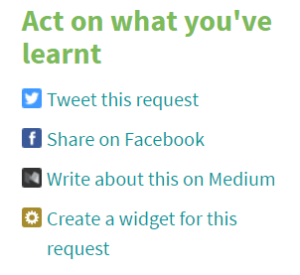 There you will find a few links, and by clicking the last one –“create a widget for this request” – you can get the HTML code. 1. Once we are in an “Add new post” page, we can select between two different tabs over the text box (visual and text). We select the text tab, which is the HTML editing one. 2. Then, we paste the widget code wherever we want to see it in the post. And, of course, with a little broader notion of HTML you will be able to explore more possibilities. Take a look here or surf by your own to learn more about it. Happy Widget-ing! Next Next post: We Have the Right to Know: Is the EU-Turkey Deal Legal? So We’re Asking.